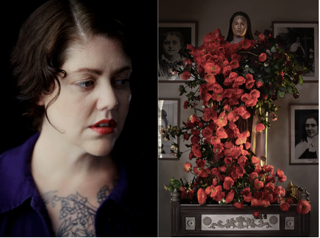 Dr Lisa Cooper is a Sydney-based florist and artist who will be taking up residency at Carriageworks to further develop her work and artistic practice. As someone who comes from a floristry background and knows the ins and outs of that business, it’s refreshing to see that there are people out there who are focusing on the beauty of flowers themselves, not just on selling them for new babies and weddings. Have a look at her website if you need convincing. Florists are most often female or you’ve got the stereotypical gay man who pops up every once in a while. With Dr Cooper’s work, however, floristry becomes architectural and sculptural, bringing the floristry industry itself into a whole new light. Flowers aren’t just for girls, they’re around all of us and are a medium of expression for those who have the patience to enjoy them. I had a chat to Dr Lisa Cooper because I was curious about what her residency at Carriageworks meant to her. It’s clear to me that she takes her art very seriously and that flowers are not just a business but a huge passion and a part of her life. Who knew that you could combine two beautiful passions, philosophy and flowers, into one career and way of life? Tell me a bit about how you got started as a floral artist? I am an artist and a florist though the two merge. In the years of my doctoral candidacy I worked at a renowned flower shop where I picked up the trade of floristry. Flowers have always been a medium in my art practice … after I was awarded my PhD I began again making work with flowers, my magnetism to them meant that in my work I wanted to be fully immersed in flowers and that is when my commercial practice in floristry began. How do you weave your philosophy into your artworks? My philosophical approach to flowers is embedded in everything I make. I don’t have to ‘weave’ – my approach to my material practice and my philosophical thought are one. What about the medium of floristry inspires and motivates you? The flowers. The toil. The contact with material that is both inexplicable and plainly of the Earth. Tell me about your journey so far as a commissioned artist? What challenges have you faced? What is your plan/hope for your artwork while you work in residency at Carriageworks? To develop my practice and become more skilled in my work. What is your plan for the future of your career in general? To work across the world. To write another book. To become an educator. What do you hope those who view your work experience and come away with? The experience of living is what inspires me. That sounds broad but it is true. I extract a lot of ammunition from the sensorial experience of being. Do you mostly work alone or would you like to/do you sometimes work with others? I creatively work alone. Thought I have amazing people who help me with the logistics and labour. I first came across you in Frankie magazine! I too LOVE flowers as a trained gardener making flowers for my little place is the best time of the day!! This entry was posted in Arts and tagged art, floristry, interview. Bookmark the permalink.